Some of the first sea turtle nests of 2018 are already being discovered by Mote Marine Laboratory’s Sea Turtle Patrol. That’s right. The turtles are coming. But it isn’t unusual for sea turtle nesting season to begin early, which officially runs May 1 to Oct. 31. “The season doesn’t officially begin until May 1, but the turtles don’t read the calendar, so they sort of show up around then,” said Melissa Bernhard, senior biologist at Mote’s sea turtle conservation and research program. The first two nests found on Longboat Key— one in Sarasota County and one in Manatee County portion — were laid by loggerhead sea turtles, a threatened species. 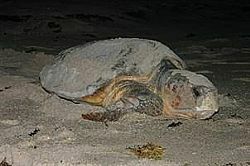 Loggerheads are the most common species in southwest Florida, followed by green sea turtles, which are also threatened. Florida one of the most important nesting grounds for loggerhead turtles, Bernhard said.